The week following the dramatic events in Paris was most certainly a rough one for its concert venues. With the city still on edge and on high alert, a lot of artists understandably chose to cancel their French and Parisian shows, whereas some chose to withstand the tension and courageously maintain their parisian date on their tour schedule. Fortunately for her Parisian fans who’ve eagerly waited for her return, Chelsea Wolfe was part of the latter group; La Maroquinerie was booked full and our diva of darkness visibly had no intention of delivering any less than the her very best performance for the grieving city. A dark-pop duo going by the name of A Dead Forest Index were given the task to start off the show for the evening and did a solid a solid job at that. The guitar and drum combo from London did a surprisingly good job at creating an immersive, full sounding musical experience all the while retaining the dynamic possibilities offered by their two-piece formation. With clear, soft yet confident vocals accompanied by the pummelling, spacious drum grooves and swelling guitar riffs ambiences bordering post-rock and shoegaze-driven influences, A Dead Forest Index made for a captivating first act. 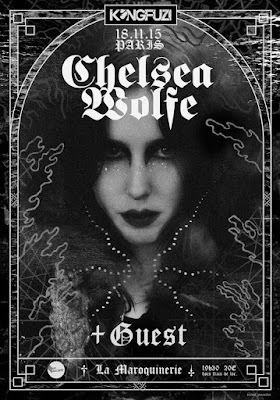 Then came the time for Chelsea Wolfe to take to the stage and mark her long awaited return. Being that I had yet to listen to her latest full-length effort, this night was my first time hearing her widely anticipated set of new songs and boy was I in for a surprise. Having seen Chelsea Wolfe on her previous european tour, I was certainly not expecting such a heavy and doomy set of songs. Wolfe was visibly determined to show her teeth to her metalhead demographic, put a heavy accent on her latest pitch-dark release Abyss with its twisted, distorted sounds and its nightmarish ambiences. Armed with a heavy dose of distortion and a crushing low-end, Chelsea Wolfe made one thing clear; she certainly knows how to sharpen her live sound for maximum effectiveness, as audiences were treated to a brilliantly paced set balancing out a hard-hitting opening and closing act with a mellower, more melancholic core. Chelsea Wolfe’s chilling and crystalline vocals were absolutely flawless in delivery and vivid in their emotional imagery, so much so that one would never suspect her recent fragile health (her show in Austria having been cancelled earlier that very same week). The band made for an equally great and equally important part of the exceptional set, displaying an impressive ability to perform with an exceptional sense of finesse and versatility. While some fans seeing Chelsea Wolfe for the first time may understandably regret the absence of some of her most popular singles in her setlist (notably Feral Love, Destruction Makes the World Burn Brighter, Tracks (Tall Bodies)), one can only give Chelsea the utmost praise for bring such a brilliantly craft and explicitly arranged show to life with such ease and poetry. Overall, Chelsea Wolfe’s set was yet of another testimony to her ever expanding creativity, outdoing herself with a set perfectly complementing her previous tour. By putting a stronger accent on the darker and heavier side of her character, Chelsea Wolfe and her band put on a magnifient soirée of somber yet moving musical lyricism. A huge thanks goes out to Marie Xxme and to Kongfuzi Booking, without which this live report would not have been possible.